Freiburg - Precious points are at stake in the battle to beat the drop as SC Freiburg host SV Werder Bremen on Friday (kick-off 19:30 GMT/20:30 CET). 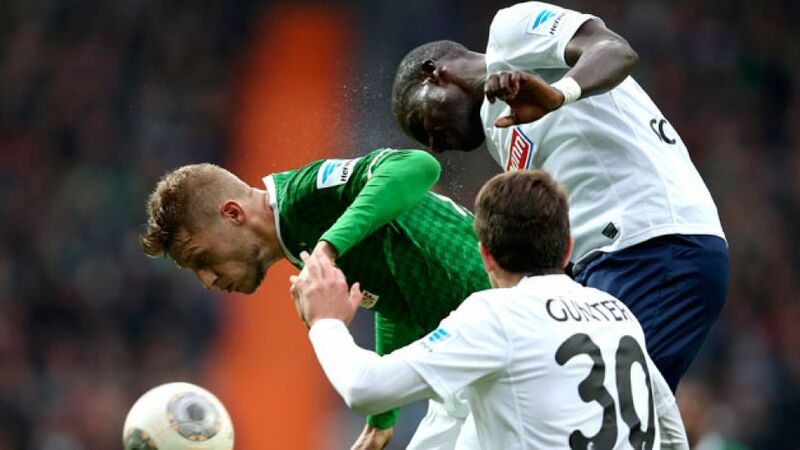 The south-west hosts managed to drag themselves out of the bottom two and into the relegation play-off spot with victory over fellow strugglers Eintracht Frankfurt last time out, but still have much work to do to secure their place at Germany's top table for another season. "It's important that we play our own game," explained Freiburg head coach Christian Streich. "Short passing, with an emphasis on build-up and constructive play are what's needed to get us through this tricky period. We have to be patient going forward. 90 per cent of the time we lose out when we launch balls into the box. We just don't have the personnel to win aerial challenges like Bremen. They've got players like [Nils] Petersen and [Franco] Di Santo and it works for them, but for us it's not possible." Freiburg's toils, during the first half of the season at least, were not helped by having to play on a near-weekly basis in the UEFA Europa League. The experience now behind them, die Breisgauer have been able to focus purely on the bread and butter of the Bundesliga, accumulating eight points since the turn of the year - three more than they managed after nine games at the start of the campaign. It might not seem like a lot, but in the context of the nip-tuck tussle that's beginning to take shape at the foot of the table, every little helps. Indeed, as well as the more obvious relegation candidates stuck in the bottom three, a further six sides are far from out of the water yet, 12th-placed Werder very much included. Die Grün-Weißen travel to the MAGE Solar Stadion only seven points better off than Freiburg, albeit as one of three clubs - the other two being FC Bayern München and 1. FSV Mainz 05 - unbeaten in their last five Bundesliga outings. "We'll go to Freiburg with a measure of confidence that we have worked on over the last few games," said Bremen striker Nils Petersen. "At the moment we're awkward to play against, as recent results show. A win can put more space between ourselves and the relegation zone and continue our run. Still, Freiburg will do everything in their power to drag us back into the relegation dogfight. I'm looking forward to a heated encounter." Petersen's Werder bedfellow Cedrick Makiadi is no less excited for a game that should see the DR Congo international midfielder come up against former team-mate and friend, Karim Guede. The two spent 18 months together at Freiburg, before Makiadi upped sticks to the northern city of Bremen last summer. "I called him and congratulated him on his goals," Makiadi said after watching his old pal score twice in Frankfurt last weekend. "I was really happy for him." Robin Dutt's side are expected to be at full strength against Freiburg after Eljero Elia (toe) and Lukas Schmitz (personal reasons) returned to training in midweek. As for Friday's hosts, with the exception of suspended midfielder Gelson Fernandes, Streich will likely name the same side that clipped the wings of Armin Veh's Eagles with such razor-sharp precision on Matchday 25.